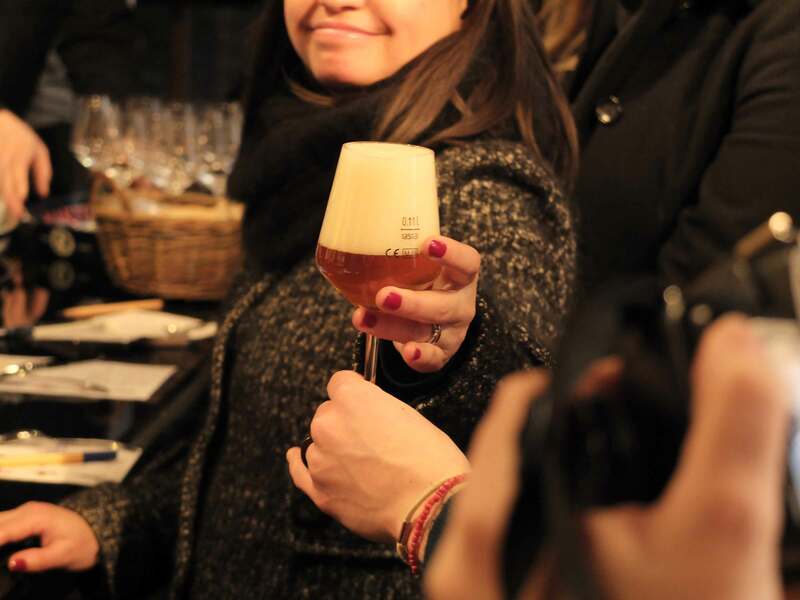 When you love to write and enjoy photography, are Belgian, a woman AND love beer, it’s hard to say “no” to a proposal to be a blogger for one day, and attend an event titled “Women & Beer”. I just happened to have the perfect profile for this assignment and couldn’t refuse it. I am a blogger, of course. Until now, my focus has been on personal travel stories but it’s time to try something slightly different. To start with, in order to give my own personal touch to this new experience… I arrived 20 minutes late. I did have the timing right ; I just forgot about how complicated it is to get to the centre of Bruges when you’re driving. Luckily, although I missed the whole introduction, I arrived just in time to taste the first of the four beers we would get to try that day: a Bourgogne des Flandres. The purpose of the first sip was to work off the stress of being late. By the second one, I started to taste properly. It reminded me of the taste of Gueuze. And I love Gueuze. The reddish colour was closer to the Rodenbach though. But the Bourgogne des Flandres is much lighter than those two beers. And my taste is for stronger brews. The second one, the Timmermans Blanche Lambicus, didn’t have a much stronger taste but the truth is I wasn’t sure if I was having beer or champagne. Okay, that might be a bit of an exaggeration. But the colour, the light sparkles and the fact that it came in such an elegant glass certainly reminded me of champagne. And our host’s introduction of this beer went in that direction too. Actually, we got to hear some interesting facts about the Blanche Lambicus. I learned – partially from what we were told and then from what I read afterwards – that lambic beer requires 6 months to 3 years of fermentation. Young lambic is then mixed with older lambic and a second fermentation takes place in the bottle itself. The process is actually more complex than the one for making champagne. Moreover, it seems to be impossible to make lambic anywhere else than in the South or in the West of Brussels. Apparently, nobody really knows why. I am not sure which brewery our host Sofie was talking about but whichever one it was, after changing the wooden beams in the brewery’s ceiling, the fermentation wasn’t taking place anymore. They had to put the old ones back in. All this put together – it‘s beer, from Brussels, that looks like champagne, is surrounded by an air of mystery, it’s complex, delicious – plus the nice spicy taste – a twist of corianderand dried orange zest – means that I am determined to find it in a supermarket close to my appartment and serve it as an aperitive to whomever enters my home again. I have carried out worse threats than these. Bourgogne des Flandres. Between Gueuze and Rodenbach. Timmermans Blanche Lambicus. Is this actually… beer? Women and beer and blogging. 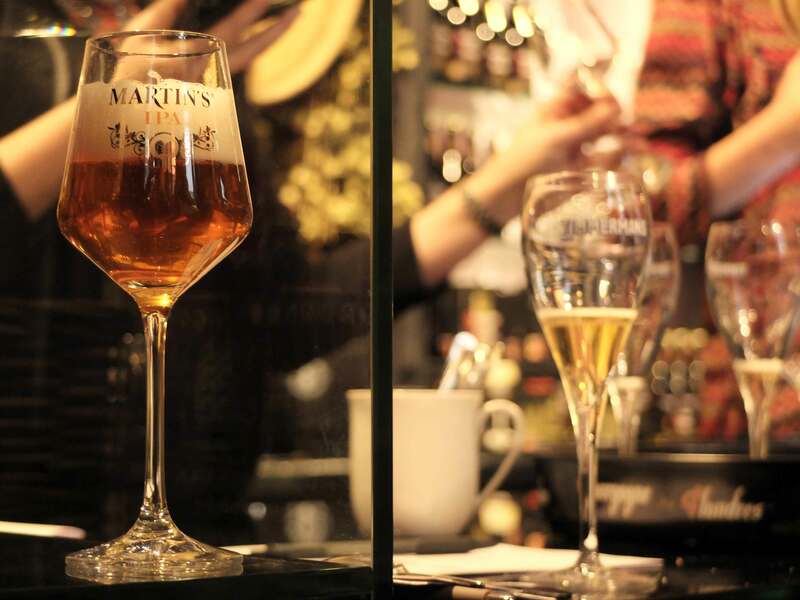 Our host for the day was the John Martin brewery, founded in Belgium in 1909 by… an English businessman. As such, besides brewing Belgian-style ales, the company also imports British and Irish beers. The third beer we got to taste was therefore a Martin’s IPA, IPA standing for India Pale Ale. I did learn quite a bit about beer that day. I am Belgian and love beer. Under those circumstances many foreigners expect you to be a specialist on the subject. But just like not every French knows every single detail about cheese or wine making, I’m pretty clueless when it comes to the technical stuff surrounding the beer-making process. I could have been a specialist but I’m just not. The most enlightened comment I can have is “I like it” or “I don’t like it”. And I certainly did like the Martin’s IPA. Of the four we got to taste, that was definitely my favourite. Slightly bitter, with a stronger taste than both the Bourgogne des Flandres and the Blanche Lambicus. And a beautiful orange colour on top of it all. The denomination “India Pale Ale”, as we learned, comes from the fact that, when the Englishmen transported their beer to India by boat, they would add extra hops for better conservation, although I read on another blog that this is actually a legend. I have to admit I didn’t do any research myself but, if the beer is good, who cares if the story is true. Just as for lambic, there’s a little mystery behind the IPA and, although it doesn’t give the beverage any extra taste, it does add to the character. One extra point for Martin’s IPA. Martin’s IPA. From England to Belgium, getting through India. Nice beer, nice colour, nice foam. The fourth and last beer that was served – don’t worry, all small volumes, I’m a responsible young blogger – was a Guinness. And, all of a sudden, I was brought back to my childhood. Not that I was drinking any Guinness as a 10-year-old, but my father used to belong to a group of computer aficionados in the late 80’s, early 90’s. After their gatherings on Friday evenings, they would sometimes go to an Irish pub close by and my mom, my sister and I would join them. Some of the guys there taught my sister Sofie and I to play darts, while the owner of the place, who had and incredible collection of bank notes from all around the world, showed us how to tap a Guinness. He would end the ritual with the drawing of a shamrock onto the beer foam. I thought it was magical. Nonetheless, I always believed that I didn’t like the taste of Guinness until the day I found myself with my mom, her best friend and the best friend’s daughter in London on Saint Patrick’s day. After hours of searching for a lesscrowded pub,- we ended up in the pub of a train station. That’s what I call a classy London evening. They had these great, totally tacky giant Guinness hats you could get. One for every four Guinnesses ordered. Coincidentally, that’s exactly how many we were. But then only one of us, between the best friend’s daughter and myself, would get the elegant foam put on. Somehow, we got a few more beers, got into a conversation with a guy at the bar who had already missed 3 or 4 trains as he started acquiring a nice collection of Guinness hats getting on the bartender’sgood side . We left the place with 3 trophies. 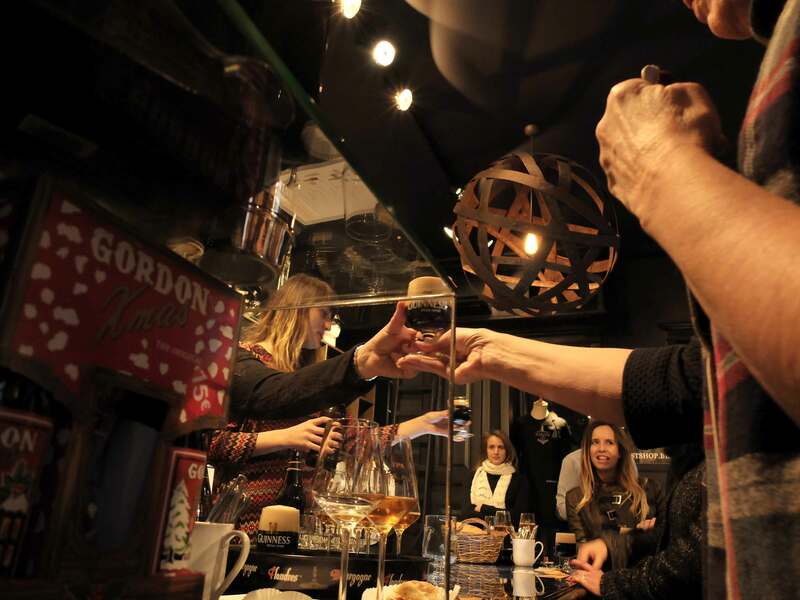 As I commented to one of the attendees at the “Women & Beer” event, when you think about it, as a Belgian, many memories and stories are linked to beer. Be it this impromptu evening in a London pub, a wedding a the brewery “La Binchoise”, my farther who used to work for the Rodenbach brewery in his hometown Roeselare as a student or my own time as a student… with episodes I don’t actually remember. A beer full of memories. Guinness Special Export: brewed specially for Belgium. Yes. There’s a but. And that has everything to do with my feminist self. It is true that beer is usually more associated with men than with women. You only need to know the slogan of Belgium’s best sold beer: “Men know why”. I am certainly to approve of an event with the title “Women and Beer”. But rather than making a step away from stereotypes, I got the impression that they were being reinforced by the theme. If you want to bring women closer to beer, do you simply some of the light versions of the brew into elegant glasses at a fancy event? If there aren’t enough woman working in IT, do you paint your booth pink at the next IT event to attract them? As I stated before, I did like the fact that beer was presented to me under a new light. But I would rather have discovered it during another type of event. 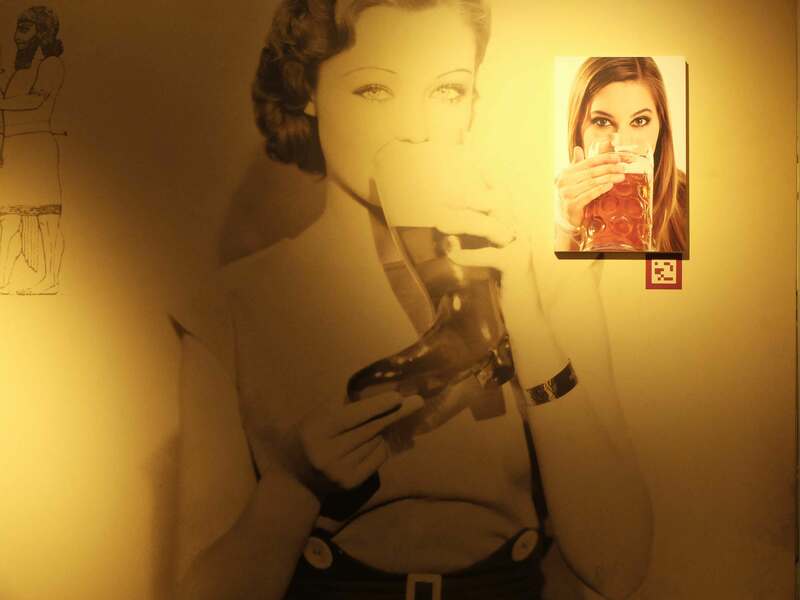 Women & beer, then & now. The tasting ended with a visit to the beer museum. 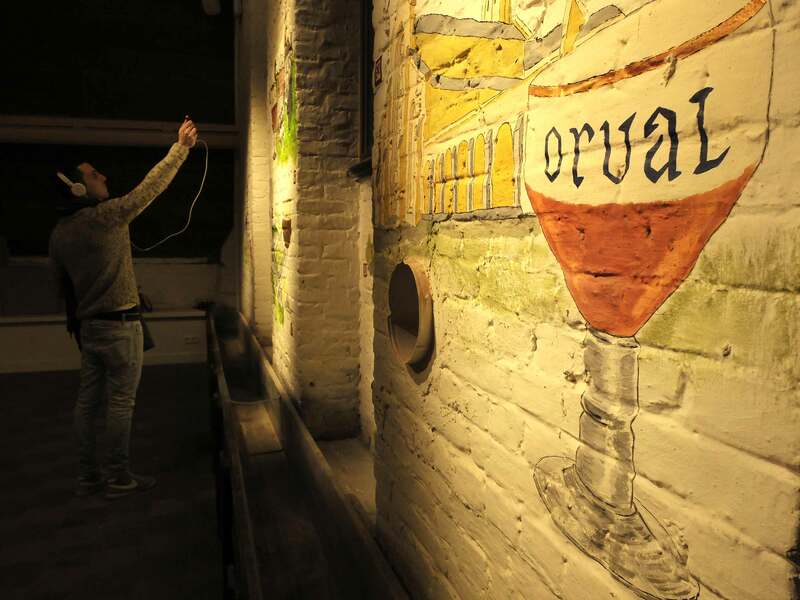 Orval. My kind of beer. Nice you remember the Guiness treat in London. Bear hug from the French Pyrenees under a thick coat of snow. Wouldn’t have thought this blog would transform itself in a beer blog but… circumstances 🙂 And, yes, definitely interested in visiting the brewery of your friend!